For our 2 days 1 night Nha Trang trip, we booked Prime Hotel Nha Trang as our choice of hotel at Booking.com. We thought of staying at a 3 star hotel since we only need a place to stay for the night. We stayed at deluxe king size room. 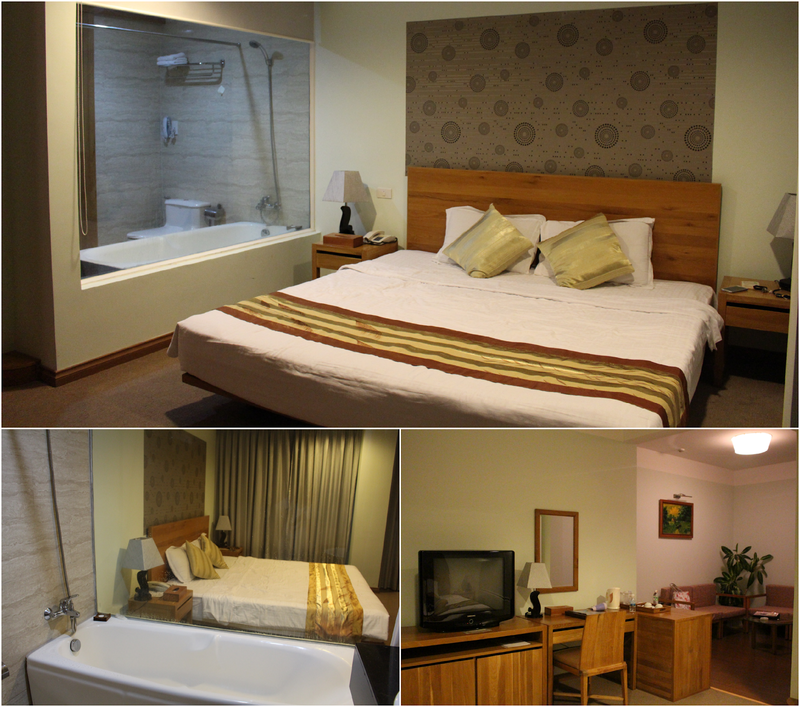 Our room is quite big as it is compose of 2 rooms: one for the bedroom area and the other for one for the living room area. Notice the glass wall separating our bathroom from the bedroom. My husband find it rather exciting! Ahaha! Ooopps! On the 15th floor of the hotel, you will get to see beautiful views of the city of Nha Trang. There is a small swimming pool and a pool bar on this floor as well as stairways leading to two small balconies: one located 1 floor up from the swimming pool and the other one is located one floor down from the pool. It's just sad that the hotel's swimming pool area is not maintained when we visited and the pool bar looks like it's no longer servicing. Prime Hotel Nha Trang is a small but neat hotel. The hotel is a good option for mid-range budget travellers especially if you're only looking for a decent place to stay for the night. We paid 1,063,287 VND which is equivalent to $75.95 SGD using conversion method of 1 SGD = 14,000 VND for a 2 days 1 night stay. Yes, you get to be a millionaire/billionaire in Vietnam just like in Indonesia. Actually, I was kind of confuse why they charge us that amount when the price on Booking.com says it's just at $49.99 SGD. Anyway, the pricing is still okay for us. There are lots and lots of hotels at Nha Trang so if you're looking for a better option, try Novotel Hotel which is located in the front of Prime Hotel or a more higher end hotel like the Sheraton Hotel. Their hotel rooms in Nha Trang is much cheaper compared to other cities around the world. To be honest, I'm not expecting any high standards for this hotel as it's only a 3 star hotel. There are not much amenities other than the pool on the 15th floor, the small dining area on the second floor and a small reception lobby on the ground floor. The peeve that I have for this hotel is that I can hear the sounds of other guests next door. I mean, who want's to be eavesdropping other people's business, right? Good thing, I don't get to understand them as they we're Russian guests next door. Don't ask me how I know this, It's just that I know. I also find their WiFi rather slow. I mean, you're bless if you get to use their internet service. However I find the hotel location very good. 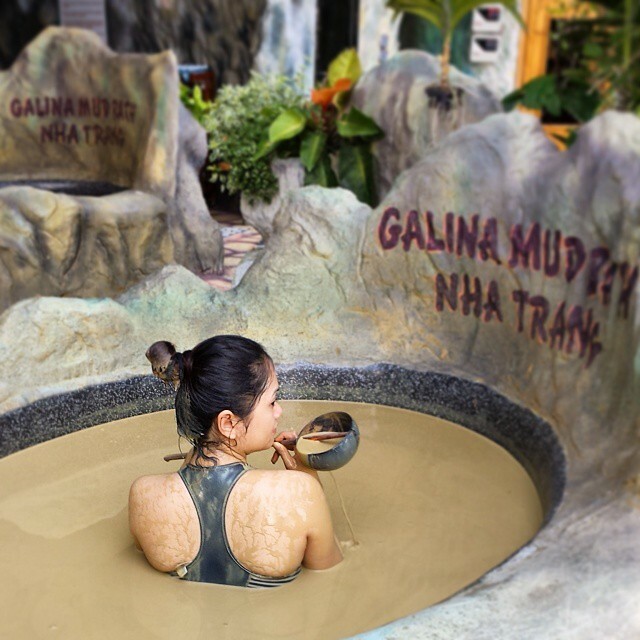 It's only a walking distance to everything from the beach; restaurants i.e Lousiane Brewhouse, Sailing Club; Galina Mud Bath & Spa; Nha Trang's cultural center, among others. Location is one of the reasons why I've chosen this hotel. Though the street scene leading to the hotel premises might not be what you've expected. We have to remember that it's only a 3 star hotel so we don't expect much, yeah? Oh, and of course, I love the beautiful views from the hotel too. That's Vinpearl Island right there. The hotel is part of Haidang Group. Why I've mentioned this is because they gave us a 30% discount to Galina Mud Bath & Spa. Yay! Actually, this is one of the reasons why we've visited Nha Trang. Will be talking more about my mud bath experience soon. Do check out my previous post : Vietnam Travel Itinerary to get more travel trips and inspiration to Vietnam.